Shepherdia canadensis covers area from Nova Scotia, Canada down south to New York and Ohio on the east coast of North America, and from Alaska down south to New Mexico and Arizona following the Rocky Mountains. It extends through the northern states of the United States. It is most common in dry to moist open woods and thickets and found in lowlands to middle elevation forests. Approximately 4950 feet – 8200 feet. Shores, riverbanks, dry slopes, moist north slopes, open rocky woods, and occasionally in calcareous marshes. It forms dense thickets along riparian zones and valley bottoms. It generally does best in partial shade, nutrient poor soils, and dry to moist water conditions. Due to its nitrogen-fixing ability, it is dominant in many areas. It is dominant along with willow in the second stage of succession in glacial moraines. 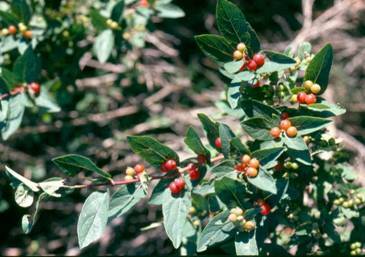 As forest transverse into old-growth forests, the cover of Shepherdia canadensis decreases. It is one of the first species to arrive after a fire. Abies lasiocarpa, Pinus ponderosa, Picea spp., Abies spp., Pinus glauca, Pseudotsuga menziesii, Populus tremuloides, Pinus contorta, Picea engelmannii. Seeds are to be collected in the autumn months (August/September) and not let to dry, should be cold stratified immediately. Vegetative cuttings of half-ripe wood should be taken in July/August. The plant will not fruit until after the first 4-6 years of its life. Cold stratification for a minimum of 60 days is necessary for embryo development (dormancy breaking). Sulfuric acid scarification for 20-30 minutes will create better results of germination. Storage life is approximately 42 months. Dry to 50% below harvest weight, and store at 400 F.
The most successful propagation method is cuttings of sprouts off the root crown. Seed germination is very difficult due to natural seed coat breaking by birds and animals. Seedings grown in the nursery, then in a cold frame until their first winter, then planted in spring or summer. Resistant to drought, so water sparingly. Height can range from 3-13 feet tall. It has a shrub form. Data compiled by: Kevin Klein, 18 May 2003.